Alkaline PH filter for Reverse Osmosis system is an inline cartridge with mineralized ball & calcite media. The alkaline filter improves the PH value of the RO water which could be lightly acid after the reverse osmosis process. It also gives back healthy minerals such as ionized calcium, magnesium, sodium, potassium ion, which were taken away while purifying the water. Capable of increasing the PH value of the RO water by 0.5 to 0.8, which helps minimize the fluctuations of your body's pH. The minerals from the alkaline filter are natural calcium, magnesium, sodium, potassium ions, which can be absorbed 100% by the body. These ions are structurally smaller molecules which help the body take in more water and replenish quickly lost water. Improves the qualities of clean water by adding necessary minerals for proper human development and health, such as Calcium, Magnesium, Sodium, Potassium and others readily found in many natural mineral waters. Filter life for each cartridge: 6 months or 1500 gallons, whichever comes first. The upgraded alkaline filters come with quick connections and fittings. Please attach the included fittings to the filters and connect the tubings to the fittings. You may discard the old compression fittings. Fits most RO systems, including those brand name models. Length: 9 3/4", O.D. = 2 7/8"
Standard sized 10" x 2.5"
The upgraded post-filters come with quick connections and fittings. Please attach the included fittings to the filters and connect the tubings to the fittings. You may discard the old compression fittings. The F4AK 6-month filter pack comes with a total of 4 replacement filters so the filters can be changed on schedule for 6 months. 1x 5 Micron 10" Sediment Filter (1st Stage, #FP15): Removes dirt, rust, sand, and other particles. Replace approximately every 6 months. 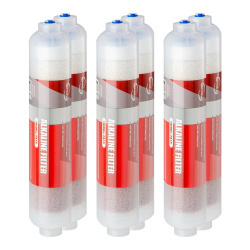 1x 5 Micron 10" Granular Activated Carbon (GAC) Filter (2nd Stage, #FG15): Absorbs chlorine, halide, organic contaminants, odors, and other impurities that contribute to bad tastes and odors. Replace approximately every 6 months. 1x 5 Micron 10" CTO Carbon Block Filter (3rd Stage, #FC15): Further removes any remaining chlorine, tastes, and odors. Replace approximately every 6 months. 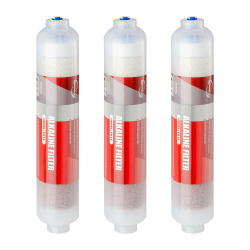 1x Alkaline pH Remineralization Filter (6th Stage, #FA15): Adds 0.5 - 0.8 PH back to the water. Also adds back healthy minerals such as ionized calcium, magnesium, sodium, and potassium which were removed during the RO process. Replace approximately every 6 months. Note: The 6-month filter supply does not come with an RO membrane, as the membrane only needs to be changed every 2-3 years. To get a filter pack that includes the membrane, take a look at the 2-year F19K75 or 3-year F28K75 supply pack. This filter pack fits the iSpring RCC7AK, RCC7P-AK, and most other RO systems that use standard sized filter housings including Flowmatic, PuROLine, Crystal Quest, and Apec.and Apec. 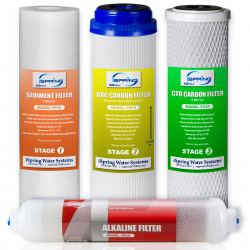 This Alkaline pH filter for Reverse Osmosis systems is an inline cartridge with mineral balls, calcite media, and corosex. The alkaline filter improves the pH value of the RO water which could be slightly acid after the reverse osmosis process. It also gives back healthy minerals such as ionized calcium, magnesium, sodium, potassium ion, which were taken away during the water purifying process. This filter is capable of increasing the pH value of the RO water by 0.5 to 1.2, which helps minimize the fluctuations of your body's pH. The minerals from the alkaline filter are natural calcium, magnesium, sodium, potassium ions, and others readily found in natural mineral water, which can be absorbed 100% by the human body. These ions are structurally smaller molecules which help the body take in more water and replenish lost water quickly. 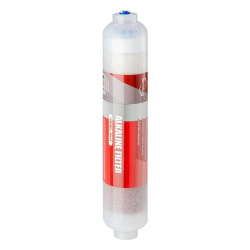 Includes high-quality 3-layer Alkaline mineralization filter cartridge with Mineral Stone, Calcite, and Corosex. Uses FDA grade material and media, tested by independent third-party to meet NSF/ANSI Standard. Improves the taste of RO water by adding back minerals such as ionized calcium, magnesium, sodium, and potassium ions. Increases the pH level by 0.5-1.2, which helps minimize the fluctuations of your body's pH. Provides better hydration than plain water. Also compatible with quick-connect fittings for a leak free install. 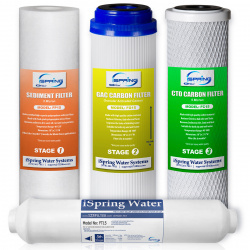 Located in Alpharetta, Georgia for over a decade, iSpring Water Systems LLC is a family owned company specializing in reverse osmosis water filtration systems. Our products include residential and commercial reverse osmosis (RO) systems, whole house water systems, ultrafiltration systems, shower, faucet, and counter top filters, filter cartridges and housings, RO coolers, and kitchen faucets and fittings. Our aim is to make high-quality drinking water accessible for all households. With affordable pricing, solid quality, prompt delivery, and top notch customer service, we hope to assist in bringing you great water.for years to come.